The Kelowna Rockets made a couple of moves during the Western Hockey League's Trade Deadline day. 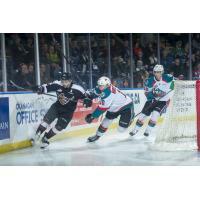 The Rockets released 20-year-old forward Lane Zablocki and claimed 20-year-old defenceman Matt Barberis from the Vancouver Giants. Zablocki was acquired in a trade with the Victoria Royals earlier in the season. In 22 games played with the Rockets, Zablocki had four goals and eight assists along with 31 penalty minutes. Barberis was originally drafted 20th overall by the Giants at the 2013 WHL Bantam Draft. The Surrey B.C. product 85 points (21G, 64A) in 168 WHL games. The veteran 5'11, 185-pound defenceman has been an Assistant Captain for the Giants over the last two seasons. "It wasn't an easy decision to release Lane," said General Manager, Bruce Hamilton. "The way our hockey club is today, we had the chance to pick up a really skilled overage defenceman that will help us give our young guys more and more ice time. I think it's important that Korczak, Steffler, Thomson and Augustine get to play more and with one of the three overage defencemen all the time. They'll get a chance to improve their game and play in situations that they don't get to all the time. Barberis is a skilled, great skating player. He has had a tough year injury-wise, but he's cleared to play, and we're excited to get him into our lineup. He probably won't play until next weekend." The Rockets are currently on the road for back to back games against the Prince George Cougars Friday and Saturday. They'll return home to host the Moose Jaw Warriors on Wednesday, January 16th for Hat Trick Wednesday. Tickets are on sale at selectyourtickets.com, at the Prospera Place box office or by phone at 250-762-5050.